Front and rear wheel uprights were newly designed for the Silvermine type 11SR. A detailed stress and deformation analysis of the new uprights was performed by Italian specialist company Phitec Ingegneria (https://www.phitecingegneria.it). 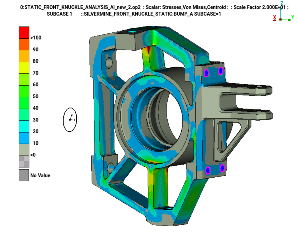 This was done by means of Finite Element Analysis (FEA). Material stresses (also internal) and deformations were presented for various load cases of each upright: bump, braking and cornering. 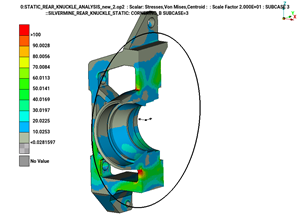 Recommendations for improvement of design and neutralizing of stress concentrations were indicated by the FEA company, and implemented in the final design.